Unique and quality built home with northern views of Camelot Lake. 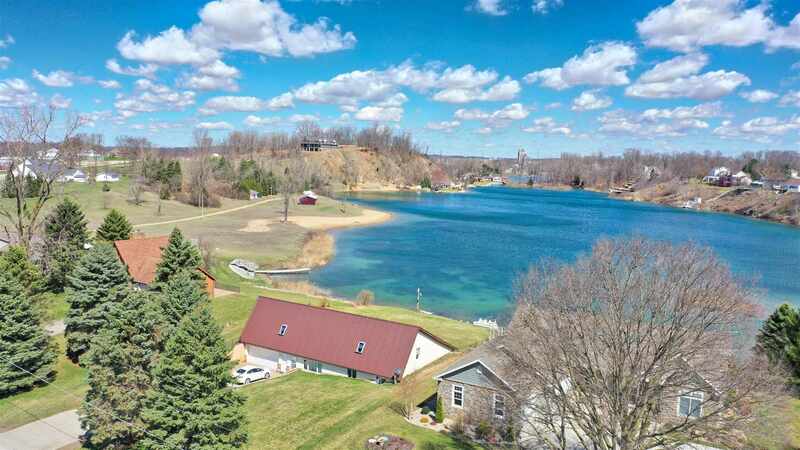 With 100 ft of lake frontage, enjoy swimming, fishing and basically any water sport at this lake! Camelot Lake even features a slalom course for the avid skier in the family. The home is quality and well built boasting very low utility bills and proving to be very energy efficient. Geothermal HVAC runs $100-115 monthly! 3 bedrooms and 3 bathrooms are all on the main level. The kitchen features custom cabinetry that is &apos;Amish Made&apos; locally. A three season room overlooks the water views and large slightly rolling back yard. A great spot for entertaining or winding down after a long day of lake time. A huge bonus room runs length of home- providing lots of possibilities- could be family room, more bedrooms, office space, or whatever needed. This home was designed for low maintenance living, energy efficiency and to enjoy year round living on Camelot Lake.